CARFAX 1-Owner. PRICED TO MOVE $1,800 below NADA Retail! 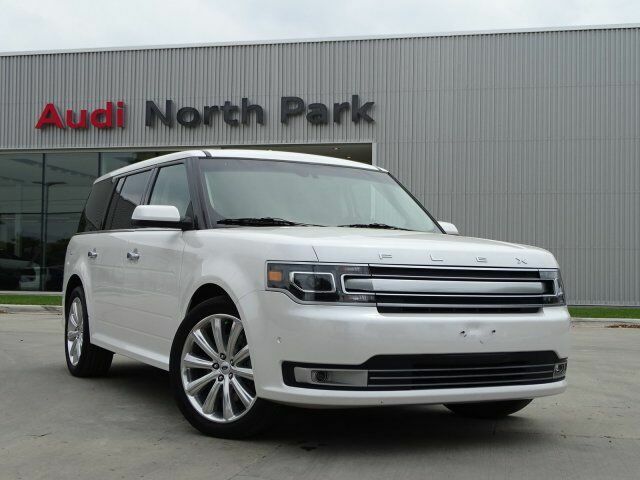 Heated Leather Seats, NAV, 3rd Row Seat, All Wheel Drive, Turbo, Alloy Wheels, TRANSMISSION: 6-SPEED SELECTSHIFT AUT... EQUIPMENT GROUP 303A, ENGINE: 3.5L ECOBOOST V6 AND MORE! EQUIPMENT GROUP 303A Adaptive Cruise Control & Collision Warning, brake support, Heated Steering Wheel, Active Park Assist The active park assist activation button replaces one 12V powerpoint, 1-Touch PowerFold & Tumble 3rd Row Fold Flat Bench 3rd row seat folds into floor, vinyl 50/50 split bench and tailgate seating feature, 10-Way Power Heated Cooled Driver/Passenger Seat, Power Tilt/Telescopic Steering Column, ENGINE: 3.5L ECOBOOST V6 dual exhaust w/bright exhaust tips and heavy-duty 78 amp battery (STD), WHEELS: 20" POLISHED ALUMINUM (STD), TRANSMISSION: 6-SPEED SELECTSHIFT AUTOMATIC paddle activation (STD). MP3 Player, All Wheel Drive, Onboard Communications System, Remote Trunk Release, Privacy Glass, Keyless Entry, Steering Wheel Controls. Edmunds.com's review says "The Flex drives smaller than it looks because it doesn't lean as much as taller SUVs when you're going around turns.". This Flex is priced $1,800 below NADA Retail.